Apologies for the long break, as various obligations have tied this writer down the past two months. However, as Edison Chen once said, we are coming back harder than ever with some new content. And one of those is the first-ever guest blogger entry on The Golden Rock. Recently, we were kindly offered an opportunity to watch a new film called SUPERCAPITALIST, written by actor Derek Ting and directed by Simon Yin. Due to scheduling conflicts, we sent Marco Sparmberg, founder of Haexagon Concepts and Hong Kong-based director of HAEXAGON and web series SQUATTERTOWN. As he will mention in the review, Mr. Sparmberg also worked in development at Salon Films for a year, so he definitely knows a thing or two about developing a film here in Hong Kong. Just to further throw Marco under that bus, Marco’s views about the film are his own, and they do not represent LoveHKFilm.com nor this blogger. A rare English-language indie film from Hong Kong that tries to remake WALL STREET the Central way. Featuring common expat clichés, SUPERCAPITALIST offers a TV thriller without the thrills. Before I start selling my shares, I need to put this disclaimer up front: In the summer of 2010, SUPERCAPITALIST was one of the projects that passed my desk seeking financial investment. I had actually recommended this project to my boss for further consideration at the time. Now that the production is completed and has been screened in a theater, would I still recommend it? Unfortunately, I would not. A financial thriller set in Hong Kong, Macau and New York set up as a sophisticated international co-production by a group of young expat talents that might bring Hong Kong film back to the world map of cinema, the film’s premise is indeed intriguing and promising. So, what happened? Conner Lee (Derek Ting) works at a New York-based hedge fund firm. 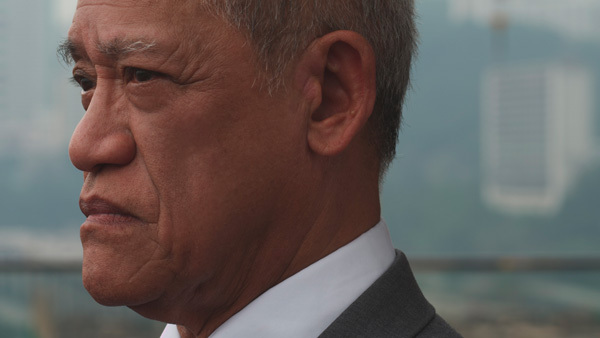 When he starts to become a troublemaker for his boss, he is sent to Hong Kong as an expendable asset to “shake things up” in the local market. Arriving in the fragrant harbor, he takes the tourist bus and LKF bar tour. The message “we are in Hong Kong and spend money at random” is repeated, as we see Connor gets sucked into the generic urban life of decadence, which includes junk boat trips with two bikini models for each of his fingers. 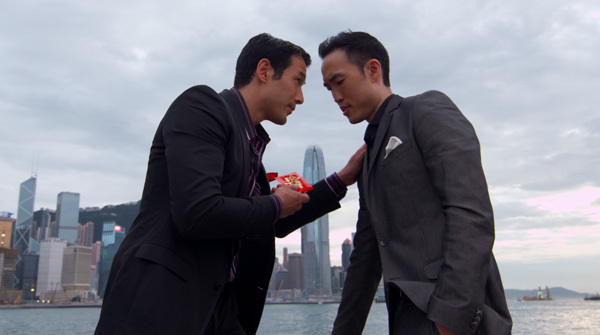 Then, a plot suddenly emerges when Conner gets the order to rip off a local tycoon (Richard Ng). In the process of taking over his company, Connor falls for the tycoon’s attractive assistant (Katy Uyen). When he also finds out that he is being double crossed by his own boss (Linus Roache) and the tycoon’s brother (Kenneth Tsang), Conner joins forces with the locals to save the company. The way local Hong Kong people are portrayed here should be a cause of concern. The filmmakers navigate into dangerous waters by implying everyone can be bribed with red pockets in this city. At the same time, Richard Ng’s multi-billion dollar tycoon stubbornly holds on to his family traditions and old-school business models, effectively weakening him as his brother gets established as the greedy villain. Meanwhile, every other local character, including Katy Uyen’s, is mere accessory to the Asian-American hero who saves the day. SUPERCAPITALIST is an extremely rare independent Hong Kong feature film effort by expat filmmakers, fueled by the online artist community Alive Not Dead. It is Simon Yin’s first feature film as well as the first lead role for writer-producer Derek Ting. The film and its team clearly aimed for too much, all the while ignoring critical issues like the financial crisis or Hong Kong’s increasing rich-poor gap for the convenience of repeating an old story pattern. Even when Oliver Stone is struggling to pull off a decent financial thriller these days, why should Yin be able to bring anything new to this conference call? The team could have instead achieved much more by taking a cue from MARGIN CALL, which took a minimalistic approach and could’ve been produced easily in Hong Kong for instance. Notable, however, was the short Q&A session with Richard Ng after the Hong Kong press screening (at IFC, of all places). Ng spoke about how he first rejected the young team and dismissed them as not serious but eventually agreed to take the role. However, he later changed his mind and says that he truly believes in the talent and the potential in his team of up-and-coming filmmakers - a statement that comes off more sincere than the usual promotion talk (”We are really pioneering!”) by some of the other speakers on stage. Yin and Ting may have wanted to play like big brokers on the surface, but they end up coming off like they’re collecting leftovers from some company party. Production value is below average even for a Hong Kong film, with everything looking like TV. The film has technical issues that are so apparent on the big screen that I was constantly kicked out of the story, finding myself wondering what and who was responsible for such sloppy camera work. Following what has become the current go-to distribution strategy for independent films in the States, the producers has struck a deal with All Rights Entertainment and will release SUPERCAPITALIST simultaneously in theaters, Cable VoD and on iTunes. In my opinion, the theatrical run is more or less a face-saving act by the traditionalists in the team, as the VoD downloads will bring the real numbers. Solid, but not profitable enough, returns from the Asian American community can be expected, especially since the film is acting as the Centerpiece Presentation at the 2012 Asian American International Film Festival in New York City. However, the film will probably only attract expats during its August release In Hong Kong. Ultimately, SUPERCAPITALIST could have been so much more. As an expat filmmaker in Hong Kong, I would have liked to see it setting a precedence as a case of people wanting to do something outside of the usual RomCom and Martial Arts genres. However, it’s sad that I can see every single attempt and compromise that was made along the way while watching the film. From personal and professional experiences, I understand a production has its limits and constraint, as well as the effort and hard work that go into making such a product. However, there were simply too much sacrificed or approached with the wrong attitude. I would be delighted to see this underdog succeed as it had so much potential, but this is not the film we had hoped for, and it will probably vanish in the sea of insignificant investments soon. So, let me close with a note to all the expat filmmakers out there: Hong Kong is not just that glittery thingy between Causeway Bay and Central. That place you call The Dark Side, most of us call the city. There are so much more relevant topics and amazing locations to explore. It really is worth a try! Regardless of the film’s quality, we thank Marco Sparmberg for his review and the organizers of the special screening for this special opportunity. Photos courtesy of All Rights Entertainment.